When exactly did Augustus die? Today marks exactly one week left until the big day – the bimillennium of Augustus’ death. One thing you may want to know as the day approaches is how we know when he died, and how the ancient evidence can be converted into modern terms. The date of Augustus’ death is not controversial. Multiple ancient sources tell us when it happened, and the date is easily convertible into modern terms. Starting with the year, Velleius Paterculus (who was alive at the time), Suetonius and Cassius Dio all place it in the consulship of Sextus Pompeius and Sextus Ap(p)uleius. Using a table of Roman consuls with the years of their offices converted into modern terms such as this one, we can easily equate this to the year which we call AD 14. 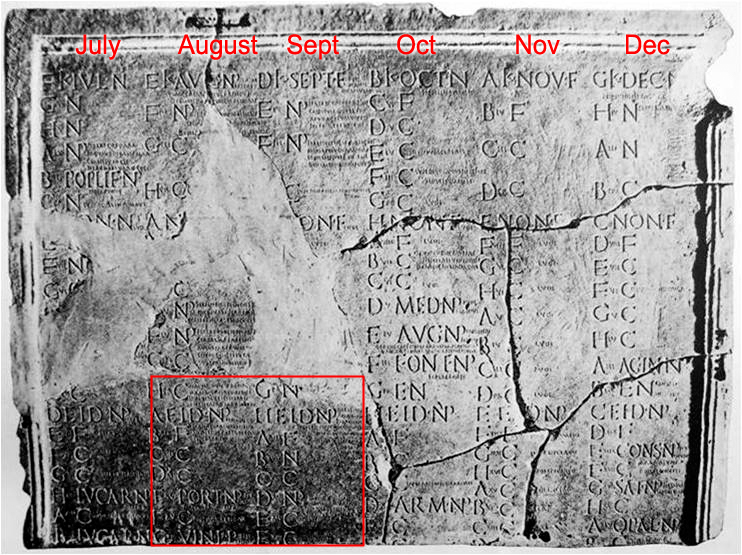 As for the calendar date, it was known to the Romans as ante diem xiv kalendas septembres (fourteen days before the Kalends (or first) of September), which is what we call August 19th (a simple Roman to modern calendar date converter is here). This is also given by Suetonius, but we don’t have to rely on him alone, because as an important event in the history of the ruling imperial family, Augustus’ death was written up into the public calendars as soon as it happened. 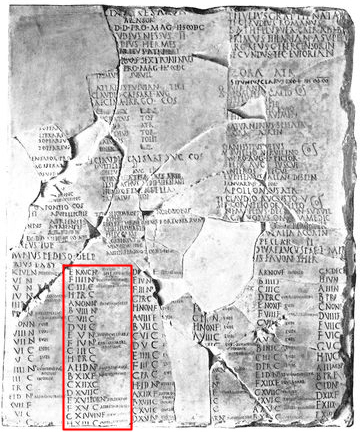 For example, the Fasti Antiates Ministrorum Domus Augustae (CIL 10.6638), a list of magistrates from the years AD 31-51 with a calendar underneath, marks that day with the words ‘Augustus excess(it)‘ (‘Augustus died’), while the Fasti Amiternini (Inscr.It. 13.2.186ff. ), dating from the reign of Tiberius, labels it simply ‘dies tristissi(mus)‘ (‘a very sad day’). The Fasti Antiates Ministrorum Domus Augustae, with August outlined in red. See below for a detailed view of that section. Close-up drawing of the month of August from the Fasti Antiates Ministrorum Domus Augustae. 19th August is the last but one entry from the bottom, labelled with a letter ‘G’ (showing its place in an 8-day market cycle) and followed by XIV, indicating ante diem xiv kalendas septembres. The calendar then informs the reader that this day is the VIN(alia), a festival of wine, and F(astus), meaning that business was allowed on that day, followed by the information ‘Augustus excess(it)‘ (‘Augustus died’). The Fasti Amiternini. See below for the section enclosed in the rectangle. Close-up of the enclosed section (in colour!). 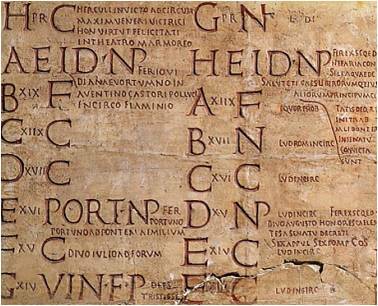 See bottom left for ante diem xiv kalendas septembres (again identifiable from the letter G followed by XIV and VIN). This time the day is labelled ‘dies tristissi(mus)’ (‘a very sad day’). That’s pretty solid, then. Insofar as we can be sure of anything, we can be sure that Augustus died on August 19th, AD 14. But wait! There have been adjustments to the calendar between then and now, haven’t there? Did August 19th AD 14 take place at the same point in the solar year as August 19th 2014? Well, thankfully, dates from this period of history pretty much did. Here’s how it goes. In the late Republican period, the Roman calendar consisted of 12 more-or-less lunar months of 28 or 29 days each. This, of course, wasn’t enough to supply the 365 days (roughly) needed to fill a solar year, so the priests were supposed to insert an extra (usually quite short) month known as an intercalary month as and when needed to make up the difference. By the time of Julius Caesar’s dictatorship in the 40s BC, though, it had become very apparent indeed that they were not doing it properly. December was happening in the early autumn – that sort of thing. So Julius Caesar appointed a panel of astronomers and mathematicians to sort the whole thing out. They came up with the system known as the Julian Calendar, consisting of 12 longer months plus a single leap day every four years, and this was introduced after an extra-specially long year of 445 days in 46 BC designed to get the calendar year back into sync with the solar year. This isn’t quite the end of the story. A few decades later, it was recognised that the extra leap day had been being applied every three years, instead of every four as it should have been, and Augustus himself stepped in to correct this. Censorinus says that this happened in the 20th year of the Augustan era (i.e. 8 BC), and although there is some debate about exactly when the newly re-corrected system came into play, it had certainly happened before Augustus died in AD 14 – which for our purposes is good enough. It means that in AD 14, the calendar had very recently been reset to match up with the solar year, and leap years were being applied correctly. So the day in AD 14 which was called ante diem xiv kalendas septembres should fall at pretty much exactly the same point in the Earth’s revolution around the sun as the day which we call 19th August in 2014. This means that the fact that the Julian-Augustan leap year system still wasn’t quite right, because it results in years an average of 365.25 days long, when the solar year is actually closer to 365.2425 days, and the fact that this also had to be corrected 15 centuries later by the introduction of the Gregorian calendar doesn’t really matter to us. Augustus’ death happened very shortly after a calendar reset, so it isn’t subject to the sort of calendar ‘drift’ which had built up by the 16th century, and affects dates in the period shortly before the reform. Phew! He died in the same room as his father Octavius, in the consulship of two Sextuses, Pompeius and Appuleius, on the fourteenth day before the Kalends of September at the ninth hour, just thirty-five days before his seventy-sixth birthday. I’m prepared to trust Suetonius on this detail, since he was working as an imperial secretary at the time when he wrote his Life of Augustus, and clearly had access to contemporary primary documents such as letters from the imperial archives, several of which he quotes in the work. So it’s perfectly likely that he had seen an official report stating the exact time of Augustus’ death. Translating that time into modern terms, though, is complicated, because the Romans used a completely different system from us for numbering their hours. Rather than divide the full day into 24 hours, starting at midnight, the Romans didn’t really bother counting the hours of darkness. Instead, they divided the period of daylight into 12 equal hours, starting with the first hour in the morning, and ending with the twelfth hour which finished at sunset. So when Suetonius says that Augustus died ‘at the ninth hour’, he doesn’t mean anything like what we mean when we say ‘9 o’clock’. He means during the ninth hour of daylight between sunrise and sunset on August 19th, AD 14. Well, no, because to them it was a very simple and naturalistic system, which basically boiled down to using the same sundials all year round. This page explains pretty clearly how Greek and Roman sundials worked, and how they related to seasonal hours, while this page has some great pictures of the kind of sundial used. Known as a scaphe dial, a hemispherical sundial or hemicycle, the basic principle is that it allows you to divide your day into twelve equal segments, no matter how long the day itself is. So if you use this kind of sundial, the Roman twelve-hour ‘concertina’ system seems natural and easy. It is only when you try to convert their time into our rigid, unchanging hours that everything gets complicated. If you want to make that conversion, what you have to do first is establish the time of sunrise and sunset for the place you are interested in at the correct time of the year. In our case, that’s Nola in Italy, and this page shows us the correct times for sunrise and sunset on 19th August: 06:16 and 19:54 respectively in local time. That means the total length of the day will be 13h 38m (or 818 minutes) in our terms. To work out the length of a Roman ‘hour’ on that day, we simply need to divide the full day into 12 equal segments, which gives 68.2 minutes. I have included the local time at which each Roman ‘hour’ begins and ends at the top of the diagram, so we can now see that the ninth hour in Nola on 19th August will begin at 15:21 local time, and end at 16:29. If you happen to be in Italy, then, that’s it – job done. You can mark the very moment of the bimillennium of Augustus’ death, as near as we are able, somewhere between 15:21 and 16:29 on 19th August. If you live elsewhere, though, you may want to convert this to your own local time-zone, so that you can mark the exact time in your country when two thousand years have passed since the death of Augustus in Nola. Right now (and this will still be true on 19th August), Italy is on Central European Summer Time, which is equivalent to Greenwich Mean Time plus two hours. So in the UK, currently on British Summer Time (GMT+1), we are one hour behind Italy, which for us means the time of Augustus’ death equates to between 14:21 and 15:29 our time. If you want to convert it to your own local time-zone, you can do so here. I will personally be running a conference at the exact moment of the bimillennium, and as we have such a packed programme I decided some time ago not to try to carve out a space within it at the moment of the ninth hour, but to get on with the papers – surely an appropriate tribute to Augustus in themselves! Besides, I have some special things up my sleeve for the evening of 19th August, when the conference delegates will be gathering together for a Commemorative Dinner in honour of our man. His passing will not go unacknowledged in Leeds. But how about you? Do you have something planned for the very moment of his death? Comment to tell me about it if you do! Thanks you! Fascinating, and clear. Thanks for letting me know! I’ll add it to my list.